Researchers at the Petrie Museum of Egyptian Archaeology at University College London have found that a collection of ancient jewelry is out of this world. The 5,000-year-old Egyptian beads, previously thought to be made from iron from Earth have been found to be made from hammered pieces of meteorite. Strung together with gold, gemstones, and other minerals, the beads pre-date iron smelting, showcasing the metalworking mastery of fourth millennium B.C. Egyptians. The otherworldly beads were first discovered back in 1911 in a tomb in Lower Egypt. Since they were discovered in a burial offering, the evidence that the gems and metals used were considered valuable is obvious. 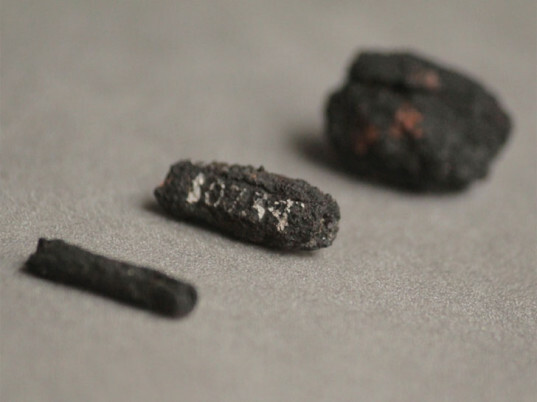 First mistaken for magnetite, the corroded iron beads were sent to the lab to be X-rayed and studied to determine the metal’s precise origin, since iron smelting wasn’t developed for another 1,500 years. Led by Professor Thilo Rehren, the researchers scanned the beads with beam of neutrons and gamma-rays. They found the items to be rich in nickel, cobalt, phosphorous and germanium, a characteristic of meteoritic iron. Ancient metal-workers hammered the meteoritic iron into thin, pliable sheets. The sheets were then rolled into hard tubes, then cut and strung onto jewelry along with other gems and minerals that are still considered valuable today. Other beadwork of the time was traditionally made by drilling, but the bead samples show that ancient artisans were able to adapt their methods to their materials. The space beads are now on display, strung in bracelet form.